Discussion in 'Confirmed Event Discussion' started by HypnoHooves, 10 February 2019. 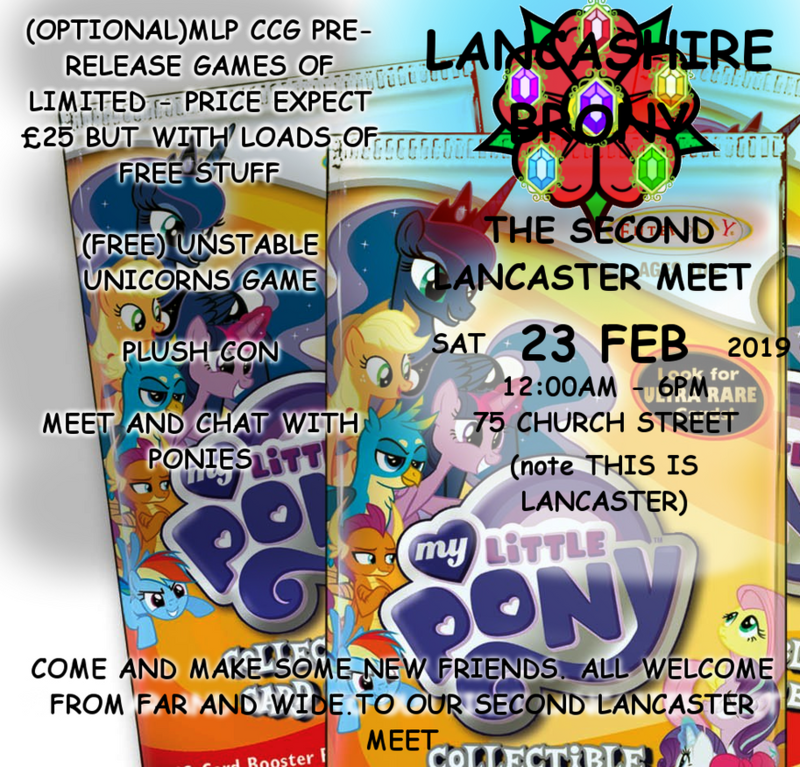 Welcome to the second LANCASTER meet!. Every local pony is welcome to this gathering of the Lancashire herd- but we know many of you travel hundreds of miles for these events. Our venue is 75 church street (with fallback of meeting in the sun hotel next doors bar in case of venue failure), this venue is run by the former Dice and Donut's For what will no doubt be a large and friendly gathering. The pub sells cider(hopefully now, they ran out last time), soft drinks and a good range of food. 13:30 MLP-CCG limited format new release! Plus old release available for limited tournament. Will be in and definate its a go. loads of free giveaways. if you never played before now is the time to give it a try! 13:30 pony Unstable unicorns as a free games for those not playing the ccg. Friendsforever is released, we got the packs and can celebrate the new release! . Incase of problems we got foils for other releases and can run the CCG! remmeber it is thie saturday. looking forward to seeing you. we got bronies from far and wide again coming. the ccg is optional plenty of other stuff on! great meet, so great to see you all again!